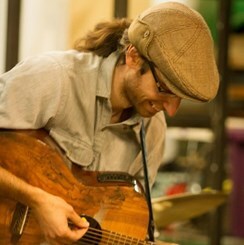 Gio has been playing music for over twenty years, being classically trained on piano and self-teaching guitar. He performs in various venues around Denver, having played for a Flamenco Duo, a Jazz group, a Blues outfit, and also does performances for the elderly. He has five years of teaching experience. His students have ranged from ages 6 to 50. He is an effective communicator and enjoys working with children. He regularly plays over at the Corner Beet on Sundays for brunch and during their Open Mic nights. Gio was recently accepted into Metropolitan State University's jazz piano program. He is sure to bring fun and interest to any genre of music you choose to learn with him! Request Lessons with GIO today!